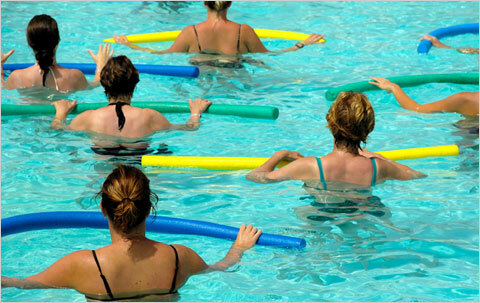 Water Aerobics and Aqua Exercise: Fun Fitness for All Ages and Abilities! Water aerobics are a great way to keep moving and a fun, fit way to start your new year off right! Yes, the Arthritis Foundation offers aquatics programs – and, yes, many senior citizens and older folks have arthritis. But, as we know, people of ALL ages can get arthritis, too – and water aerobics are the perfect type of exercise for those who do have it. Keep it in mind, though, that water aerobics doesn’t have to equal elderly. So whether you are 15, 55, or 95, here are some fun facts and great tips about water aerobics and other forms of aqua exercise! Supermodel, Victoria’s Secret “angel”, and wife of NFL quarterback Tom Brady, Gisele Bundchen, credits water exercise as her secret weight-loss weapon to drop her post-baby-weight just a month after giving birth. During her midriff-bearing heyday, Britney Spears partook in a water aerobics program that targeted her abdominal muscles. Swimming is often recommended as exercise for children with juvenile arthritis. Some YMCA locations offer arthritis-friendly aquacise in special heated pools. Professional athletes often utilize water aerobics or other forms of aqua exercise to help them recover from surgery or injury. Many use treadmills built right into jacuzzis! Former NFL athlete Frank Johnson used water aerobics to recover from a total knee replacement, and Pittsburgh Steelers super star Troy Polamalu loves his “water workouts,” as does Kenyan distance star Lornah Kiplagat. 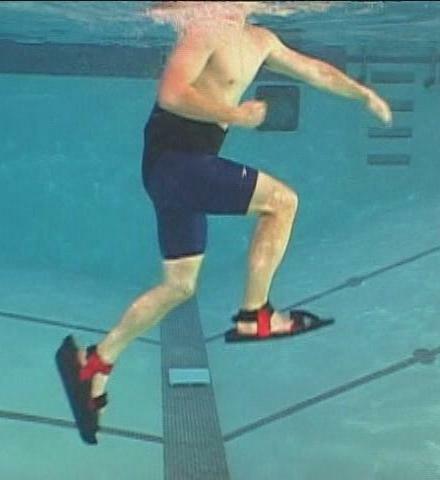 In fact, many professional sports teams (NBA, NHL, NFL) use water workouts as a standard part of training and conditioning! It is a non-weight bearing exercise. Improves core strength and endurance. Great exercise for pregnant women and those with arthritis. Burns enormous amount of calories. Many land-based exercises such as Zumba dancing, ballet, running, or kickboxing, can be translated into a water aerobics format. You do not have to suffer from physical limitations to gain benefits from water aerobics, but it is great for those who do have physical limitations or disabilities. Even though you are exercising in water, you still need fluid replacement. So hydrate, and drink plenty of water, even if you don’t know that you are thirsty! You can do water aerobics in shallow or deep water, but should begin in the shallower end of the pool. It is a fun and enjoyable exercise often set to music. Great way to modify or spice up normal routine. Remember to monitor your exertion! Always listen to your body! Ask your doctor before beginning an aqua exercise class. Be careful of slippery/wet areas AROUND the pool – don’t fall! Make sure an instructor is present and lifeguard on duty. Many places offer regular adult/teen water aerobics, as well as “silver” water exercise classes for seniors! Some places have special routines/classes for those with arthritis, of any age! Water exercise, just like many other types of exercise, aid in weight loss, lowering blood sugar, and reducing or controlling stress. The added benefits of aqua exercise that conventional workouts cannot provide are what sets it apart, especially for those of us with arthritis! Because of our buoyancy in water, 90% of our body weight is supported during aqua exercise or water aerobics. This means that there is not as much strain on joints! Thus, it is potentially much more enjoyable and safe for people who cannot partake in “typical” exercises or aerobic workouts. I am going to start water aerobics for 2011 – who’s with me? Remember — physical activity is the BEST way to relieve arthritis pain and stiffness, as well as a good way to increase mobility. For range of motion exercises, try doing a neck roll, shoulder roll, elbow bend, and wrist roll, as well as general stretching….and, of course, contact the Arthritis Foundation for info on land and water exercise classes! Your rheumatologist and/or physical therapist may be able to direct you to some aqua aerobics classes, as well, or, may have suggestions/recommendations for what other kind of exercise, physical activity, stretching, etc. may be right for you. Just think of this: did you know that you’re stiff in the morning from rheumatoid arthritis and osteoarthritis due to lack of motion & prolonged inactivity? It’s true. Staying active lessens stiffness! So, as we move into 2011, why not make – and keep – a New Year’s resolution to try swimming or water aerobics to help loosen up those joints and build those muscles? Tags: @ArthritisAshley, Adult Water Aerobics, Aqua Aerobics, aqua exercise, aqua therapy, Aquacise, AquaLogix, Aquatics Programs, Arthritis Ashley, Arthritis Foundation, Arthritis Foundation Programs, Ashley Boynes, Autoimmune Illness, Brazilian Body Surf, Britney Spears, Chronic Illness, chronic pain, Disability, disease, exercise for arthritis, exercising with arthritis, fibro, fibromyalgia, Frank Johnson, Gisele Bundchen, Health, heated pools, Human Body, hydro works, Hydrotone, HydroWorks, JA, JIA, joint friendly exercise, JRA, Juvenile Arthritis, Lornah Kiplagat, low impact exercise, Mid Atlantic AF, Mid Atlantic Arthritis Foundation, Mid Atlantic Region, MidAtlanticAF, MLB, NBA, New Year's Resolution, NFL, NHL, OA, Osteoarthritis, osteoporosis, physical activity, physical therapy, Plyometrics, pool, Pool Exercise, pools, PT, RA, resolutions, Rheum, rheumatic disease, Rheumatoid Arthritis, rheumatology, Spoonie, Spoonies, Swimming, Teen Water Aerobics, treadmill, Troy Polamalu, water aerobics, Water ballet, Water Exercise, Water Workouts, weight loss, Wellness, YMCA. Bookmark the permalink. I’m going to do water aerobics too! good luck! have a happy new year.